This little chap made for a really cute baby picture with his white fluffy fur coat on the ice floes of Atlantic Canada. Heather and Paul McCartney on the Ice to Protect Harp Seals with the Humane Society of the United States before the hunt starts. March 2.2006, Gulf of St. Lawrence. 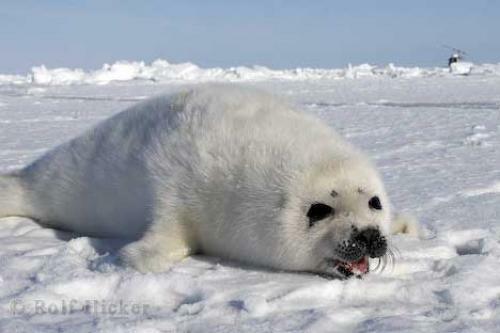 Pictures from photo gallery "Harp Seal Pictures"
This picture is part of the photo album "Harp Seal Pictures" - there are more beautiful images waiting for you.